Barcelona were worthy winners of the latest edition of el Clasico with a thumping 5-0 victory over Jose Mourinho's Real Madrid at Camp Nou. Xavi opened the scoring on 10 minutes after a defensive mistake by the away side. Pedro added a second eight minutes later with a close-range finish. Barcelona continued to control the game and made it three on 55 minutes with an expert David Villa finish who added another three minutes later. The cherry was placed in the cake in the 91st minute when substitute Jeffren bundled in a fifth. To add to their misery, Real Madrid were reduced to ten-men in the 93rd minute when Sergio Ramos received his marching orders. Pep Guardiola's men return to the top of La Liga after inflicting the first defeat of the season for Real Madrid who will have to show plenty of mental strength to bounce back from this demoralising defeat. The first chance fell to Barcelona on six minutes when Lionel Messi nearly produced a moment of magic worthy of gracing any game. The diminutive superstar nonchalantly curled a left-footed effort towards the top corner from the tightest of angles but could only watch on as the ball rebounded off the post and to safety. The home side continued to press the visitors and got their just rewards on 10 minutes through a slice of luck. Andres Iniesta's wonderful through-ball was nearly intercepted by Marcelo. However the Brazilian left-back could only knock the ball into the path ofXavi who after some unconventional control, poked the ball past Iker Casillas from six yards out. Real Madrid came close to levelling matters two minutes later. Mesut Oezil played in Angel di Maria on the edge of the Barcelona box and the Argentine unleashed a powerful effort that was acrobatically tipped over the bar by Victor Valdes. On 14 minutes the away team came close again when Cristiano Ronaldo's clever ball found its way into the Barcelona box and Eric Abidal narrowly avoiding putting the ball past his own 'keeper under pressure from Karim Benzema. However, the home side looked sharp and went two up after 18 minutes through some excellent work by David Villa. The Spanish striker received a precise pass from Xavi on the left before jinking past Sergio Ramos and firing a low cross into the los Blancos' six-yard box which Casillas failed to deal with leaving Pedro with a simple task of knocking the ball in. The Blaugrana were threatening to run riot in the most anticipated game of the season and came close to making it three on 28 minutes. Xavi pinged a wonderful defence-splitting pass towards Pedro yet the goalscorer was beaten to the ball just inside the box by an alert Casillas. Jose Mourinho's men were in desperate need of a goal and nearly scored on 35 minutes. Ronaldo's trademark free-kick looped over the wall and flew narrowly wide from 25 yards with Valdes at full-stretch. Four minutes later Real Madrid had a decent claim for a penalty when Valdes appeared to make contact with Ronaldo who was running away from the goal. A case of the Portuguese schemer's reputation preceding him. The game threatened to flare-up just before half-time when Messi and Ricardo Carvalho came together in a midfield tussle. The defender appeared to make contact with the Argentine's face yet Messi did make a meal of the challenge as Itturralde produced a yellow card for the winger, the fifth of a fiery first-half. Barcelona continued where they had left off in the second-half when they nearly added another goal on 47 minutes. Messi's slaloming run past the Real Madrid defence before seeing his eventually shot take a deflection into the path of Villa who saw his 12 yard effort expertly blocked by Casillas. A third appeared to be on the cards as the home side were agonisingly close to scoring on 51 minutes when Messi's clever through-ball found Xavi who attempted to round Casillas before seeing his tight-angled shot hit the wrong side of the side-netting. Barcelona did make it three on 55 minutes when Messi played a fantastic pass between Pepe and Carvalho with the deadly Villa controlling the ball with one touch before slamming it low past the helpless Casillas. Amazingly it was four on 58 minutes when Messi played the pass of the night to slice open los Blancos' defence with Villa outpacing his opposition before calmly poking the ball through Casillas' legs for his 10th Barcelona goal. The away side were dead and buried as Guardiola's men continued to control proceedings with Carvalho extremely lucky to stay on the pitch on 71 minutes for a deliberate hand-ball which denied Barcelona a clear goalscoring opportunity. However, the experienced defender escaped with a yellow card. It was not to be a hat-trick for Villa as he was replaced by Bojan who almost made an immediate impact on 75 minutes when he saw his powerful 20 yard drive punched to safety by Casillas. The home side continued to dictate play as Real Madrid attempted damage limitation. However there was to be a fifth in the 91st minute when substitute Jeffren chipped the ball into the net from a Bojan cross six yards out. 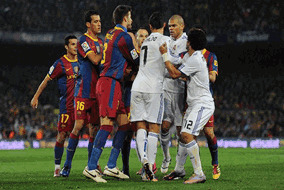 To add to the humiliation, Ramos received his marching orders in the 93rd minute for a crunching challenge on Messi. Barcelona now head two points clear of Madrid who drop to second. Barca head to mid-table Osasuna on Saturday while los Merengues entertain Valencia at the Bernabeu.